This the chapter Indiscretion, from part 2 of the Twist Inside. Angren, Sigrid and Terrance have arrived in Ripon, seat of Baron Harold Gumb, intent on visiting a neighbour of his. As a matter of courtesy, the Baron invites them to a formal dinner. All you need to know in advance is that Angren’s first sight of Helen Travers, the Baron’s niece, was memorable. Something to do with manacles, and the lack of clothes. See Miss Travers and the Sorcerer, in part 3 of The Best of Men. Angren climbed onto the viewing platform, a popular destination, apparently, for the people of Ripon though today he had it to himself. The view on one side took in the twist of the river, the towered houses of the town and the great forest beyond, but on the other, and more importantly, it revealed the snaking path that ascended the Hill of Powers, and the fourteen statues that stood like a crown circling its bald top. The statues seemed to be representations of giants, but he wasn’t close enough to make out their features. He studied the path. It was very odd. He could see at least twelve people labouring on their way to the top, but at intervals all the way up there were others standing still, or kneeling, or even lying down. The path was quite steep, but he didn’t think it was that difficult. Whether or not, he decided to give it a miss. Angren wasn’t too interested in sculpture, not enough to raise a sweat for anyway. Angren started at the voice. He wasn’t normally so easily approached without knowing about it. Angren chose to ignore the comment. Angren favoured Alan with a smile that had more to do with menace than pleasantry. Angren looked Travers up and down and then glanced over at the ladies. Suddenly red in the face, Travers sputtered rather than spoke. Angren was pleased with himself. He smiled generously at Helen as she and Sigrid stepped onto the platform. But the look Sigrid returned was mistrustful and his smile disappeared. Sigrid raised an eyebrow, unusually cautious, but Helen looked at Angren, and then looked at Alan, and was suddenly convulsed with laughter. Alan took offence, very easily. But Alan wasn’t listening. He walked off so quickly his hat blew off. He didn’t stop to retrieve it but clattered away down the steps. Helen had stopped laughing. She stooped to pick up the hat. Angren himself felt very foolish. This time it was Sigrid convulsing in laughter, and Angren who became red in the face. The Great Hall of the manse was impressive. Not so great as the hall of the ducal palace in Dyffily, with no dais, and no pillared galleries to the sides, but it was far more welcoming. Angren’s father favoured a military display of weapons and armour, with less than exuberant hangings, sparsely arranged – he never would listen to his wife’s suggestions when it came to rooms of state. But here was a room designed for comfort and entertainment. Big enough to house the two long Low Tables and a smaller High-table, but the oak panelled walls, the collections of ornament and sculpture, and the fine oil paintings all around, all lit by the three extravagant lanterns hanging from the high ceilings, conspired to give the room a familial feel. At least forty people were present already, milling around and chattering in convivial fashion, waiting for the order to be seated. At the high-table Gumb was there to greet warmly his companions of battle. Alan Travers was there too, standing behind his chair, two places to Gumb’s right, silent and seemingly out of sorts. But other important members of the household, including the Baron’s Chief Lieutenant and his Chancellor, with their wives, were all keen to engage Terrance and Angren and Sigrid in conversation. Mostly they wanted to talk about the horror of the affair at Moreda and the catastrophe in Astoril. Angren tried his best to be polite. Weaving through the guests, half a dozen page boys in livery brought trays full of glasses of Apian sherry, taken up delightedly by everyone present. And in one corner of the room two fine guitarists played pretty rondoncinos, and minuettos that even Agren recognized as Ravennese. Apian taste and culture were most fashionable just now and considered more refined than traditional Aegardean style. Baron Gumb was clearly determined to impress. Angren wondered about that. Was it because the Baron was now fully aware of his guests’ pedigree? Angren snorted loudly at the thought. Sigrid elbowed him. Well, no, he didn’t. Governing Terremark was the last thing he wanted. Angren had learned to love a life on the road. He enjoyed his anonymity. He sought out adventure, though he didn’t always find it. He settled for variation. He settled for not settling. Sometimes he had found himself taking a job duller than deskwork, but at least he was always in a position to walk away and find something else. He absolutely did not want to be tied to duty. It was perhaps a bad thing that he’d told his father where he could stick his duty. It was probably a bad thing he’d stormed out of the palace, out of the city, and out of Terremark entirely. But that was two years back and Angren tried not to have regrets. “Can we drop it? Anyway, I think the show’s about to start.” He indicated a small commotion at the doorway. There a butler in his best regalia hit a silver gong with a silver hammer. The announcement was code for “please get to your seats,” and after a brief bustle of activity in getting to them, the ladies walked in and processed up the aisle between the tables. The Baroness seemed in a jolly mood, calling greetings to friends all along the way. Helen was less so. She was nodding politely but unenthusiastically at the dignitaries on the side tables. She didn’t seem able to find a smile for anyone. “Your new friend doesn’t look too happy.” Angren muttered. When the ladies reached the high-table, Gumb ushered his wife to her seat at his left, and Alan Travers pulled out the seat between himself and the Baron for Helen to take. She stood unmoving for a long moment, but then looked over at Terrance on the far left of the table. Terrance was not slow to understand, or to respond. He stepped up quick and offered his hand. Sigrid gave Angren a quizzical look, and Angren noticed Gumb sharing a much more intense look with his wife. His wife shrugged. They were parcelled out among the High Table diners. Terrance was well blessed, of course, with Helen for company. Angren, opposite the Baroness, seemed satisfied enough, with Gumb’s wife a lively and humorous lady, perfectly happy to match the weapon-master glass for glass. Sigrid, unfortunately ended up sandwiched between the bereft Lieutenant J�rn Galsby, and Gumb’s Chancellor, Arnold Peasbody, and sitting opposite the morose and angry Alan Travers. Alan barely spoke at first, or even looked at her. Instead his envious gaze drifted time and again down the table to where his sister and Terrance were engaged in animated, and good-natured conversation. Meanwhile both soldier and administrator tried to outdo themselves in being polite and respectful to their guest. Sigrid found them utterly boring. And the questions they asked regarding her family and position revealed a staggering lack of knowledge when it came to the impact of the Massacre at Aristeth. Staggering at least to a victim and survivor. Once satisfied they had allowed their guest the briefest of replies they quickly turned to matters in Ripon and the wider forest. They were sure that she would be interested, the Lady Althone having been an important factor in the Battle of Moreda. This line of thought led them into speculation about the new balance of power in the region, given that the Morredans had been annihilated to a man. Sigrid, for the sake of courtesy at Lord Gumb’s table, took a sip of wine before she trusted herself to respond. To punctuate this statement Alan downed his almost full glass of wine and signalled for another. The chamberlain was silenced and gave his attention to the last of his meat. But the Lieutenant was not so cowed. Alan refused to respond, staring at the tableware before him. After a few moments he took up his next glass of wine. The guitarists now picked up a lively tune, perhaps thinking the spat was over, but Gumb was not quite done. Though the rondoncino ran brightly between the guitars to entertain the hall, the High Table itself had fallen silent. Helen Travers was glaring at her brother, daring him to look up. Sigrid noticed only a sideways glance before the Heir of Hartest resumed a study of his dining plate. “Lady Helen tells me you have some knowledge of our inventor friend?” Sigrid almost grinned: it was Terrance, riding to the rescue. The Baron was happy to be distracted. Alan snorted extravagantly, and then clunked down his glass far too heavily and inaccurately, sending a fork spinning across the table towards Sigrid. She refused to react and instead decided to keep the conversation going. This time it was Helen who responded. Cries of criticism, of surprise and confusion rang among the diners high and low, and bounced among the rafters. Helen bowed her head only for a moment before she pushed up and away from her seat, left the table, and left the room. Alan smiled sarcastically at his uncle, and then chinned the air in defiance. And so, go he did, pacing down the aisle, heels clicking on the wooden tiles, looking neither left nor right. He barged through a cluster of waiting servants on his way. Several trays were upended, and bottles smashed on the floor. As the door slammed shut behind him, the room erupted. Amid the furore the Baron got to his feet. Sigrid thought he looked weary of it all. As the hubbub resumed in a less forthright manner, Gumb left his seat. J�rn and Arnold both rose promptly, stopping only to bow to Sigrid before they all marched off. Sigrid watched them go, her hands gripping the cushion she sat upon. “Well that was fun,” said Angren. She was so furious with him she couldn’t speak. He flinched from her black look as she also got to her feet. Sigrid pounded along the corridors. Trust him to cause such a mess, she thought. It was all just a joke to him, and now look at it. How could he do that to Helen? “Never speak of this,” she’d told him, “Never!” But did Angren ever listen? Helen’s hand was on the handle of the door, her rooms and respite from this horrid evening just a step away. But she turned to face him down. He pushed his face up to hers, lifted a hand to caress the nape of her neck, pulled at the pins to release her mane of hair. “Alan, stop it! You’re drunk.” She pushed at his chest, but he snaked an arm around her waist and held her tight. He grasped at her skirts and spun her round, pushing her face into the door. But then she was free. 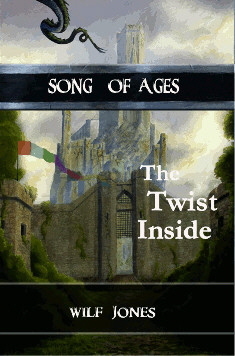 Alan screamed in pain as Sigrid slammed him up against the door jamb, her hands at his throat. Helen turned in time to see her brother release a knife from his belt. Sigrid saw it too. Sigrid gave them both a withering look as she casually disarmed the youth and threw the blade across the floor. She punched him deep in the stomach to end the fight and Alan collapsed to the floor, groaning. Harald Gumb was standing in the doorway of Alan Traver’s apartment, tapping a scroll of Rivelline parchment against his leg. J�rn Galsby could see the impatience in him. J�rn doubted that Gumb would have found an argument with his nephew too onerous. The Baron had sent him ahead to lay hands on the lad until he’d finished drawing up the papers of disinheritance. Now available as a downright gorgeous 730 page Paperback Original. If you enjoy the The Best of Men please visit the relevant link to leave a star rating and a brief review.